Since 2016, a young narwhal has been spotted swimming in the St. Lawrence River in Quebec. Somehow this narwhal got very lost – the threatened species makes its home in the Arctic, over 600 miles to the north. 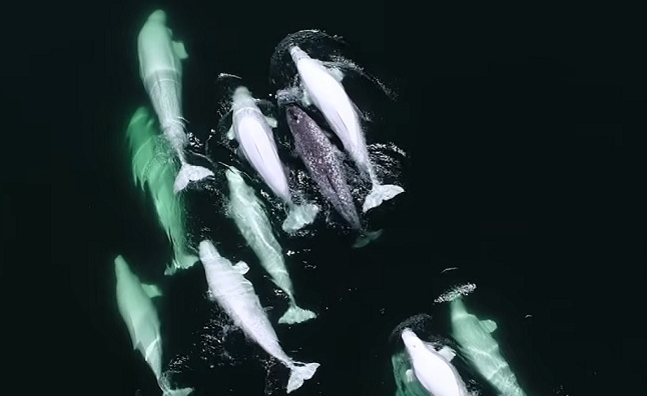 The researchers were using a drone to film beluga whales in July when they realized one of the mammals was actually a narwhal. Photos confirmed the narwhal was the same one they’d observed in the St. Lawrence River over the past two years. “It behaves like it was one of the boys,” Robert Michaud, president and scientific director of GREMM, told CBC News. The narwhal even blows bubbles just like his adopted family members. This wasn’t the first narwhal to become lost. Michaud said some have wandered as far south as New Jersey. Tragically, in their attempts to make new friends by approaching boats, some narwhals have been killed by the propellers. “That little narwhal that made a similar trip was very lucky, because he found almost normal buddies,” Michaud told CBC News. Responses to "Beluga Whales Adopt a Lost Narwhal in Canada"